One of the best ways to get natural ventilation is to keep the door open. The only problem is, it’s a way for bugs to get in as well. Keep the bugs out while letting fresh air into your home with today’s Deal. 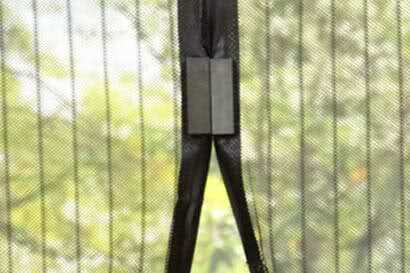 Magic Mesh Door Cover opens smoothly as you pass by and automatically closes behind you. This allows you to go out with ease even with both hands being preoccupied and without worrying that disease-bearing and annoying bugs can just come in as they please. With eighteen strategically positioned magnets, the parted screen simply shuts and snaps into place as if by magic and without a noise. Even your pets can go through with ease. Installation is a breeze and does not require any professional assistance. It doesn’t require tools, nails or screws to get it installed. It’s so easy that you can put it up during warm days and take it down as the weather gets colder. It can work with virtually all kind of doors from single doors to sliding doors as well as campers. Enjoy the benefits of natural ventilation and cut your energy bills while keeping the pesky bugs out of the house with this latest offer from redchillideals.co.za.